Dysfunction, or improper mobility, in the sacroiliac joints, also called the SI joints, can result in significant lower back, buttock and hip pain. It can also cause leg pain such as sciatica. Leg pain from sacroiliac joint dysfunction can be difficult to differentiate from radiating leg pain caused by a lumbar disc herniation as the symptoms can be completely the same. An MRI study of the lower spine can determine whether the lumbar disc is involved. Before heading off to the MRI machine, a simple chiropractic evaluation can determine if your SI joints are the culprit of that nasty lower back pain. As you can see in the diagram below, there is a lot involved in the anatomy of the area involving the sacroiliac joints, and this doesn’t even show all the muscles, fascia, nerves and other structures. The SI joints have long been the cause of controversy in the healthcare field when it comes to lower back pain. For years many doctors were skeptical that it had a role in pain that affect millions of people. It is estimated that the sacroiliac joints are the cause of 30% of lower back pain cases. Over my 27 years of treating lower back pain, I would estimate the percentage to be much higher, at least double the estimation. What do the Sacroiliac Joints actually do? The SI joints connect the ilium bones to the sacrum. The ilium bones are connected to the ischium and pubic bones to form the pelvis. The sacrum is the base of the entire spine and at the very end tip of the sacrum is the coccyx, or tailbone. The ilium connects to the ischium and then in the front at the pubic bone. The leg bones, or femurs, connect to the ilium at the hip joints. The primary function of the sacroiliac joints is to absorb shock between the upper body and the pelvis and legs. However, it also has a role in movement. This is where the pain problem can come in. The sacroiliac joints don’t have a lot of movement, but they do create motion. Mobility at these joints aid shock absorption, hip motion and bending. 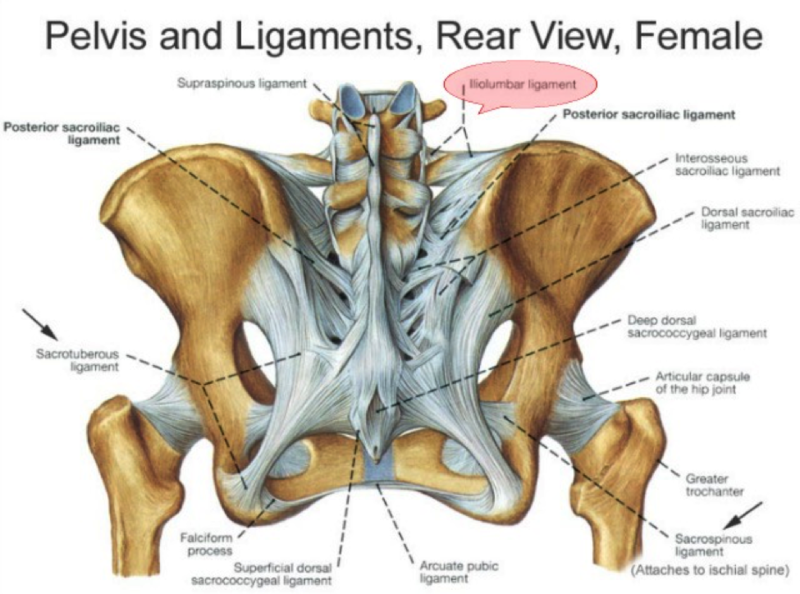 The joint is reinforced by strong ligaments surrounding it as you can see in the diagram. This network of soft tissues provides support and maintain the right amount of movement, not allowing too much. There is also a network of muscles and fascia that support the SI joints and their function include the gluteus maximus and the piriformis muscle. Too much movement (hypermobility or instability) of the SI joints. Pain from too much motion is typically felt in the lower back and hip, and may radiate into the groin area. Typically, there will be pain and tightness in the lower back up to the middle spinal region. Muscle tightness and myofascial pain is common to experience as well. Too little movement (hypomobility or fixation). In this situation the joint is stuck and won’t move. This creates added stress on other joints like the lumbosacral joint, the hip, knee and even ankle. There will be muscle tension, pain, and stiffness. All scenarios of dysfunction of the SI joints create inflammation of the joint and surrounding tissues. This will also cause pelvic pain and stiffness. Anyone is susceptible to SI joint issues because they are involved in everything we do from standing to sitting to bending, twisting, lifting, etc. Pregnant women or new moms are even more susceptible to sacroiliac joint pain because of the body changes that occur during the pregnancy and delivery process. After delivery, stress is put on the area carrying the new baby as well. Correcting the problem starts with figuring it out. A thorough examination can be quick and easy. Checking neurological function, alignment, mobility and function of the SI joints only takes a few minutes. If SI joint dysfunction is found, simple treatment can include Chiropractic Manipulation to improve and stabilize mobility and correct any imbalances present. Stretching and strengthening exercises and possibly myofascial release techniques can be very helpful in restoring SI joint function and eliminating pain. The key to wellness is being consistent and practicing effective lifestyle strategies. Even with the right plan, issues can arise. I recommend that you don’t “Wait and see what happens” if you are experiencing lower back pain. It is most often SI joint dysfunction, but prolonged dysfunction in this region can lead to overload on lumbar discs and a more serious problem can result. Get an evaluation and treatment sooner than later and you will be back to your normal self rapidly. Routine chiropractic maintenance visits can ensure your SI joint function is great. No one wants to be in pain. Eat a nutritious daily diet, exercise and stretch regularly, and maintain healthy joint and spine function with regular massage and chiropractic care. You might just end up feeling and functioning like a BOSS!